This playful spectacle is the centerpiece of our event! Our skeleton processional honors traditions where community members in skeleton costumes and masks meander through villages to visit the graves of their ancestors. Opened by the Consul General of Mexico and City Officials, mariachi musicians lead the way as this processional of thousands of skeletons streams from Huizenga Plaza west along Riverwalk. It then heads north on SW 3rd Avenue, where the celebration continues at Revolution Live Entertainment Complex. Applications will be available starting in September. Traditional community remembrance altars or “ofrendas” spring up, covered in photographs, hand painted papier maché skeletons, sugar skulls, marigolds, trinkets, food for the dead and candles. Our main location for ofrendas is at the New River Inn from 12-4pm. To participate with your own ofrenda, visit our OFRENDA page. Sponsored by Tortuga Tile Works, Corona & Jose Cuervo. Over 20 top handmade independent craft artists in the Southeast, converge to present their Dia de los Muertos inspired work in this fanciful bazaar this year in 2 locations at Revolution Live AND America’s Backyard. Founded and curated by LuRu, owner of Tortuga Tile Works, the Craft Crypt presents one of the best ways to bring a unique artisan DOTD creation home with you. Experience spectacular Mexican and Latin American performance traditions from Danza Azteca, Folklorico and Mariachi. At 9:15pm, experience an energized performance by Mariachi Mexico Internacional who have been featured on international television. 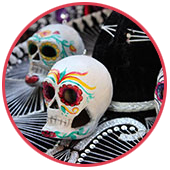 You will have a chance to make your last minute skeleton costumes and crafts while hearing Mexican Classical music live by the South Florida Chamber Ensemble and others. 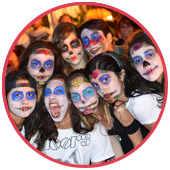 Non profit organizations, Art Buses and face painters will help you create your skeleton character. 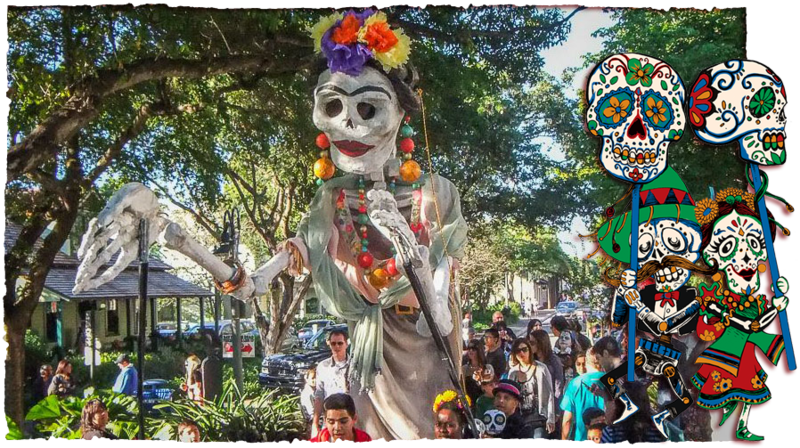 Immerse yourself in the fantastical world of Catrina and her band of skeletons from the Aztec world of the Mictlan. Costumed greeters, Latin food truck, traditional pan de muerto, los Angelitos kid’s crafts and sugar skulls cover the street in this interactive street festival.